Tyra Mountaineer is the name of one of the buildings in the complex called Tyra Summit Condos, and was the last phase of this project. Mountaineer sits on the south side of Four O’clock Run Road and the Snowflake run and lift pass near the backyard. 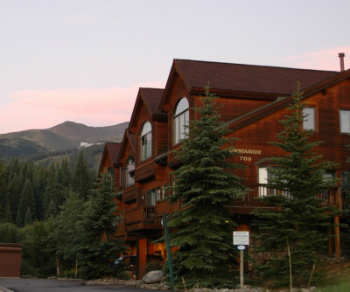 Great views of the Breckenridge ski resort come with any of the Tyra Mountaineer condos for sale. Across the road is Four O’clock Run, another trail that brings you home from the ski mountain at the end of the day. All phases of Tyra Summit Condos lie between Four O’clock Road, Sawmill Creek and Four O’clock Run. To read more, see our page about Tyra Summit Condos. Explore the available Tyra Mountaineer condominium listings within Tyra Summit below, or read more about the one-of-a-kind community. Built in three phases from 1980 to 1993, phase II and III, of Tyra Summit condos are situated in an open meadow of Sawmill Creek between Peak 8 and Peak 9, near the Snowflake Lift. Mountaineer was the last built and is slightly higher in elevation and affords great views. Tyra was the first construction this high on Four O’clock. Since then, several high-end subdivisions have filled in the vacant private land. Neighbors include Trappers Glen, Snowflake, Snowy Ridge and other exclusive subdivisions. A few more than 100 units make up the complex, and they are spread out in several buildings that have grown to look more different over time. All have done an exterior facelift since they were first built. Any Tyra Summit Condo for sale could generate good short-term rental income by virtue of their excellent location, and Mountaineer may be slightly more desireable than the others because it is the smallest – a single building – and the newest. They’re ski-in, by way of the Snowflake Run, and ski-out by the Snowflake Lift. The free town bus also stops at the base of this lift. In the summer, the ski runs and the snow-cat roads on the ski mountain are great trails for biking, hiking or wildlife spotting. A few hundred yards above Tyra is the Breckenridge Outdoor Education Center and the small Sawmill Reservoir. Several trails begin at the lodge at the BOEC and connect to other trails that extent far into the national forest. Drive one-half mile up (west) 4 O’clock Road past Tyra Riverbend Condo. Summit Condos Phase Two will be the first buildings on the right, and Phase Three, Mountaineer, is on the left. Find out why Tyra Mountaineer condos may work for you! Contact us online or give us a call at (970) 453-2200 today!